Cotswold Wildlife Park (CWP) has become a champion of renewable energy utilising ground source heat pumps to provide cost effective, energy efficient warmth for its many animals that prefer the warmer climates they came from to the typical temperatures found on the Oxfordshire/Gloucestershire border! The first part of the Park’s renewable journey saw a ground source heat pump being installed by local renewable experts Ecovision, based on the Highgrove Estate just outside Tetbury, to provide warmth for the resident giraffes at the Park which was a major success. So it made sense to look at similar technology when it came to the Tropical House and the greenhouses used to winter tropical plants. 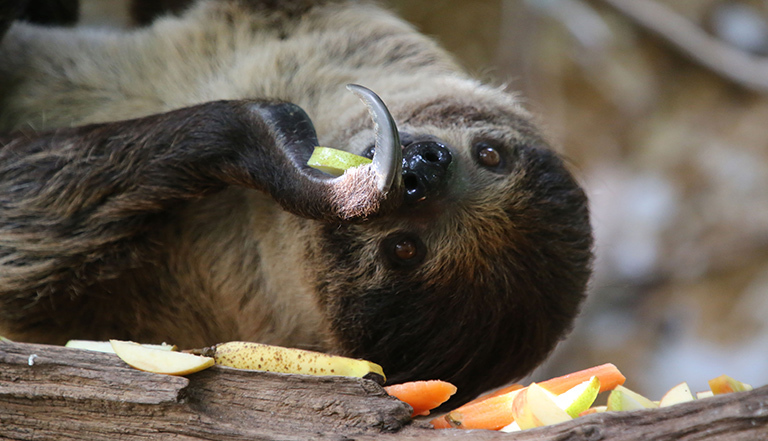 Renewable energy now also turns the Park’s Tropical House into the tropical forests of South America so that a pair of Linnes Two-Toed Sloths feel at home – courtesy in no small part to the largest bank of Stelrad Compact K3 radiators you’ll probably ever see – or will you? The back wall of the Tropical house is home to eighteen of Stelrad’s three panel, three fin energy efficient radiators, and there are four more strategically placed around the structure. But whether you will see them or not is open to question! To blend in with their surroundings in the normally steamy, misted environment created for the animals and birds in the Tropical House, the radiators have been first treated with an external corrosion inhibitor to protect them in the environment created to make its occupants feel at home . 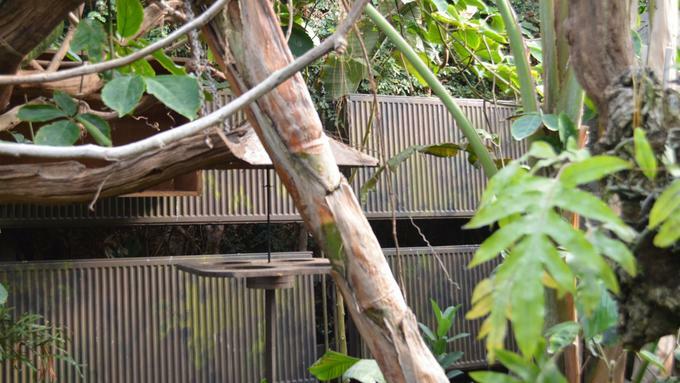 This turns the white radiators a sandy brown colour and then they have been painted in camouflage colours to blend in with the foliage and rocky back drop that makes the Tropical House seem authentic for animals and birds – and for human visitors. The radiators are ideal for operation with a lower temperature renewable ground source heat pump system. They are able to maximise the heat created from the radiator ‘footprint’ with three panels sharing the heat effectively so that the temperature in the Tropical House can be regulated easily to provide just the right environment required. The Tropical House has to run at 17°C at night and between 20°-21°C during the day, and previously had been heated by three elderly and expensive to run oil boilers, at a cost of £20,000-£30,000 a year. The decision was taken to install a 75kW ground source heat pump system, again installed by Ecovision, at a cost of just over £90,000 plus ground work costs of £38,000. The ground works, carried out by the Park, were necessary to put 18 x 200M loops into the ground at a depth of around four feet, in a field on a site across a public road, to feed the heat pump. To ensure the Tropical House was kept at the right temperature, the 22 camouflaged Stelrad Compact K3 radiators were installed along the back wall, bolted to a specially designed and constructed framework. To reduce the stress levels for the animals living in the Tropical House, work to install the radiators and additional pipes, took place around them in a ‘noise free’ zone with all the necessary work being carried out by hand – no electric power drills whatsoever! Energy efficient, but is it cost efficient? The use of renewable technology sounds great and clearly meets the owner’s personal green agenda. But was it a good investment? Was it cost efficient too? The overall cost of the ground source heat pump systems from Ecovision and the ground work, carried out by the Park itself, for both projects was in the region of £156,800.00. The estimated annual Renewable Heat Incentive (RHI) payments that will come back from Government on both projects is £10,690, which combined with the net saving (increased electricity costs but nil oil cost) means a payback of 8.6 years. The total financial benefit over 20 years, as a result of energy cost savings and RHI, and using 3% inflation a year, amounts to just over £490,000. An impressive return by any standards. It’s easy to see why Cotswold Wildlife Park is often visited by representatives from other Parks and Zoos, to see just how efficiently it is using renewable energy, not only to cut operating costs but more importantly to keep its wonderful wild animals happy and on display for all to see. For more details of the Cotswold Wildlife Park, near Burford just off the A40, go to http://www.cotswoldwildlifepark.co.uk/. Keeping sloths snug with Stelrad! Cotswold Wildlife Park’s furry residents benefit from our Compact K3.